Tracy Child will co-present with peers from Goldman Sachs and Alliance Bernstein at the May 15th seminar at The Madison Hotel. The program will discuss the unique characteristics of the Millennial generation and the obstacles advisors face and solutions for how to best serve this growing community. For further information about the seminar and to register, please visit the link below. The free, day long concert will be held on August 17th, 2019 on the historic Morristown Green. For the first time, they won't need to worry about the weather, the festival has a backup venue: The 1,300-seat Mayo Performing Arts Center. A description of the selection methodology can be found on the link below. We are delighted to add that Partner, Sandra Brown Sherman was included on the Top 50 Women Lawyers in the State list. Sherman Wells Partners have been selected by their peers for inclusion in The Best Lawyers in America™ 2019 and as 2019 "Lawyer of the Year"
The program was entitled "Arts, Management and Concert Promotion" and Mr. Sylvester addressed music business students about the strategies and ethics of negotiation. Firms included in the 2019 edition of "Best Law Firms" are recognized for professional excellence with consistently impressive ratings from clients and peers. Achieving a ranking signals a unique combination of quality law practice and breadth of legal experience. The U.S. News – Best Lawyers "Best Law Firms" rankings, for the ninth consecutive year, are based on a rigorous evaluation process that includes the collection of client and lawyer evaluations, peer review from leading attorneys in their field, and review of additional information provided by law firms as part of the formal submission process. To be eligible for a 2019 ranking, a law firm must have at least one lawyer recognized in the 24th edition of The Best Lawyers in America list for that particular location and specialty. 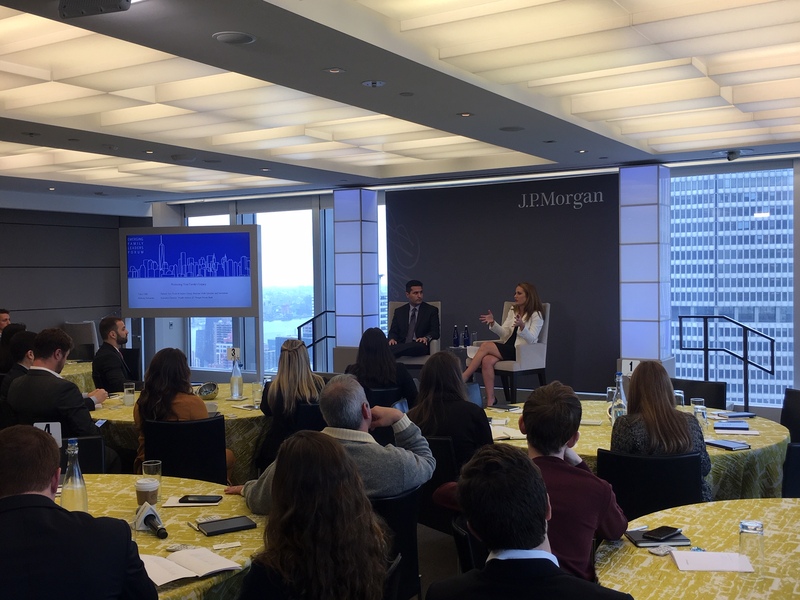 J.P. Morgan hosted the next generation of their most successful clients and prospects, which consisted of roughly 50 attendees between the ages of 25-35 (with a minimum net worth of $25mm). The agenda covered technology/blockchain, entrepreneurship, real estate, estate planning, and philanthropy. The topics were presented by key, dynamic well known speakers including Ryan Serhant from Million Dollar Listing, the Founders of Boll & Branch, Divya Narendra from Sum Zero (Zuckerberg's Facebook partner tied to the famous Facebook dispute) and our very own, Tracy Child. Preschool Advantage, a Morristown-based non-profit organization, recently welcomed Matt Mirett as a Trustee to its Board of Directors. Preschool Advantage identifies, qualifies and connects deserving families and high quality preschools, and provides the funding to enable children to attend preschools Since its inception over 20 years ago, almost 1,500 tuitions have been paid, and it is the organization's goal to fund 100 tuitions each year by the year 2019. Sherman Wells Sylvester & Stamelman LLP is pleased to announce the introduction of new Partner, Jane L. Brody, new Counsel, Peter Saad, and two new Associates, David A. Falk and Michele A. Fiorentino. The firm is also pleased to announce the addition of Cindy Scibilia and Alisa Thompson as Paralegals. The partnership will be between GMPF and Ocean County College Foundation (OCC Foundation), Ocean County College (OCC) and Ocean County Vocational Technical School Performing Arts Academy (OCVTS). The partnership will benefit the expansion of the Jay and Linda Grunin Center for the Arts and establish an endowment to support programming and celebrate the works of Louis Prima and Gia Maione Prima. In recognition of the partnership, OCC Foundation, OCVTS and OCC announced that the new theater will be named the Gia Maione Prima Foundation Studio Theatre. This year's festival will be located on the Green located in the center of Morristown, New Jersey and is scheduled for August 18, 2018 and will include performances by Rhythm in Blue, Bria Skonberg, LaBamba & The Hubcaps, Bernard Allison Group and Davy Knowles. The scholarship is part of Jazz House Kids Music and Education Fund which provides vital resources to support in-school music education programs in underserved communities across New Jersey and the needs of students attending the Jazz House Summer Workshop. The program "Music Mondays" offers free concerts throughout the summer. The series is part of Asbury Park Music Foundation's goal to unite the community, support local musicians and inspire under-served youth with music education. Partner, Anthony Sylvester interviewed on behalf of Gia Maione Prima Foundation by Complex in recent article entitled "How Did a Dead Artist End Up on ‘Kids See Ghosts'?" Mr. Sylvester discusses Louis Prima being featured as an artist and composer on the new Kanye West and Kid Cudi album Kids See Ghosts with a song that was released over 80 years ago. This is the third consecutive year Sherman Wells has made the list, ranking at #7 on the list and as the only ranked law firm in the category. The Best Places to Work in New Jersey program is made up of 100 companies that are categorized as either small, medium-sized or large organizations. To qualify, a company has to have at least 15 employees working in New Jersey; be a for-profit, nonprofit, or government entity; be a publicly or privately held business; have a facility in New Jersey; and be in business for a minimum of one year. Companies from across the state participated in a two-part nomination process to determine the 100 Best Places to Work in New Jersey. The registration and survey process was managed by Best Companies Group (BCG). BCG also analyzed the data provided and used its expertise to determine the final rankings. We are delighted to add that two firm Partners have been noted for receiving special recognition, Partners, Andrew Stamelman & Sandra Brown Sherman have been included on this year's New Jersey Super Lawyers Top 100 Lawyers list and Partner, Sandra Brown Sherman was included on the Top 50 Women Lawyers in the State list. Anthony J. Sylvester, Partner and Trustee to the Gia Maione Prima Foundation is proud to announce that Jeffery Miller, winner of the 2013 ASCAP Foundation Louis Prima Award performed with Jon Batise and Stay Human on the Late Show with Stephen Colbert on March 28, 2018. Trust and Estate Associate, Jonathan discusses how Millennials can benefit from estate planning when they see past the misconceptions and establish a basic plan that can create a legacy that benefits the people and causes that matter most. The renowned pianist/singer/songwriter Marcia Ball and her band will appear at the Bickford Theatre in Morristown on Saturday, February 10, in her only New Jersey appearance this year. For tickets and more information see the link below. Sherman Wells is pleased to announce the election of new Partner, Jordan D. Weinreich, and new Counsel, Kathleen E. Clark. The firm is also pleased to announce the addition of Michelle Leland as an Associate. On October 9, 2017, Anthony J. Sylvester, Partner and Trustee to the Gia Maione Prima Foundation attended the 35th Anniversary of Hot House Jazz Award Ceremony held at the Metropolitan Room in New York City. Click to download the photo of Anthony Sylvester and American Jazz Musician Howard Johnson. The newly-opened “Louis Prima Room” located in Joseph Merrick Jones Hall will permanently house archives that include film, tapes, photodiscs, sheet music, photographs and more. The collection was donated by the Gia Maione Prima Foundation and will be used for academic research. Driven by the philosophy that “comfort heals”, Dr. Fosnot designed the HOSPITALity® Kit with the goal of enhancing all patient experiences. To learn more about the HOSPITALity® Kit and to read Dr. Fosnot’s story, visit www.hospitalitykits.com. • Harold S. Atlas, a Partner in Sherman Wells’ Corporate Law practice group, has been listed for 10 consecutive years for Corporate Law. • William G. Connolly, a Partner in Sherman Wells’ Corporate Law practice group, has been listed for 10 consecutive years for Corporate Governance Law, Corporate Law and Mergers and Acquisitions Law. • Charles S. Detrizio, a Partner in Sherman Wells’ Corporate Law and Banking and Financial Services practice groups, has been listed for over 10 consecutive years for Corporate Law. • Sandra Brown Sherman, a Partner in Sherman Wells’ Tax and Trust & Estates practice groups, has been listed for over 10 consecutive years for Tax Law, Trusts and Estates, Corporate Law, Closely Held Companies and Family Businesses Law and Business Organizations (including LLCs and Partnerships). • Andrew J. Stamelman, a Partner in Sherman Wells’ Tax and Trust & Estates practice groups, has been listed for over 10 consecutive years for Corporate Law, Mergers and Acquisitions Law, Tax Law & Trusts and Estates. • Anthony J. Sylvester, a Partner in Sherman Wells’ Litigation, Banking and Financial Services, and Art, Media and Entertainment Law practice groups, has been listed for over 10 consecutive years for Banking and Finance Law, Commercial Litigation and Litigation - Banking and Finance. • Julian W. Wells, a Partner in Sherman Wells’ Litigation practice group, has been listed for over 10 consecutive years for Commercial Litigation & Litigation - Securities. This is one of the summer’s most popular free music festivals where music fans of all ages enjoy great performances. The festival will be held in the center of the historic town on the Green on Saturday, August 19th. Partner Sandra Brown Sherman is one of the contributing authors to the American Bar Association’s (Commission on Women in the Profession) recently published book, “Grit, The Secret to Advancement – Stories of Successful Women Lawyers”. Click below to read Sandie’s remarks about her career and the suggestions she has to offer other women attorneys. Partner Anthony Sylvester along with co-counsel, Kline & Specter, P.C. and Saltz, Mongeluzzi, Barrett & Bendesky, P.C., filed a wrongful death and negligence lawsuit against New Jersey Transit in Hudson County Superior Court on behalf of Adrianus Rudolfus Henricus Maria de Kroon, the husband of the late Fabiola Bittar de Kroon. Ms. de Kroon was killed in the New Jersey Transit train derailment at the Hoboken Terminal on September 29, 2016. Sherman Wells is pleased to announce the addition of Tax Associate Bozena (Bonnie) Diaz, a former Associate at Gibbons PC, Litigation Associate John M. Vieira, a former Associate at Clyde & Co LLP and Trust & Estates Paralegal Katrina Gieniec. Sherman Wells again recognized as one of the best places to work in New Jersey! Sherman Wells is proud to announce, of the 100 companies recognized by NJBIZ as the 2017 Best Places to Work in New Jersey, Sherman Wells was 6th and the top rated law firm in the small/medium business category. This is the second year in a row that Sherman Wells has been a Best Place to Work in New Jersey. Partners Anthony J. Sylvester and Julian W. Wells have been included in the Super Lawyers list of the Top 100 Lawyers in New Jersey. Partner Sandra Brown Sherman has been included in the Super Lawyers list of the Top 50 Women Lawyers in New Jersey. Sherman Wells featured in a recent NJ Law Journal article "With Market and Rate Pressures, Firm Spinoffs Are an Option"
Founding Partner, Anthony Sylvester discusses the opportunities for change in the firm structure and the ability to modernize practices. The 2014 spinoff created a new beginning with the focus of the development of the firm in the forefront. Anthony J. Sylvester, Partner and Trustee of Gia Maione Prima Foundation entered into a sponsorship agreement with NJPAC to support an outdoor summer concert series, Sounds of the City. The concert series which brings the very best local, national and international performing artists kicks off on Thursday evenings beginning July 6th through August 31, 2017. Partner William Connolly will speak at the Business Owners Planning for the Future Seminar on Thursday, February 9, 2017. This program is designed to help business owners plan for future growth. It will feature a panel of business owners who will share their stories of success and some of the bumps in the road. Partner Anthony Sylvester along with co-counsel, Kline & Specter, P.C. and Saltz, Mongeluzzi, Barrett & Bendesky, P.C., filed a Notice of Intent to sue New Jersey Transit on behalf of the late Fabiola Bittar de Kroon and her family. Ms. de Kroon was killed in the New Jersey Transit train derailment at the Hoboken Terminal on September 29th. Trombone Shorty to perform and price of admission is a new toy which will be donated to children of New Orleans. On December 7, 2016 - Anthony J. Sylvester, partner and Trustee of the Gia Maione Prima Foundation entered into a partnership agreement with the GRAMMY Foundation to support the February 2017 GRAMMY Camp – Jazz Session. The choir and combo will perform on Entertainment Tonight, record an album at Capitol Studios in Hollywood and attend the GRAMMY Awards. Partner Tracy Child spoke at Morgan Stanley’s Florham Park office on November 29th on the recent changes to the New Jersey Estate Tax and generally about how to advise clients on wealth preservation during this time of change. On October 24, 2016 – Anthony J. Sylvester, partner and Trustee to the Gia Maione Prima Foundation awarded the first scholarship to Seniar Raines, student of St. Vincent Academy. Raines is a bassist and pianist who aspires to become a world class musician. Anthony J. Sylvester, partner and Trustee to the Gia Maione Prima Foundation awarded the 2016 ASCAP Foundation Louis Prima Award to Brian Richburg, Jr.
On December 14, Anthony J. Sylvester, partner and Trustee to the Gia Maione Prima Foundation awarded the 2016 ASCAP Foundation Louis Prima Award to Brian Richburg, Jr. at the Jazz at Lincoln Center, New York. Anthony Sylvester and Anthony Valenziano will speak at the Morris County Bar Association’s seminar “The Ethical Implications of Technology and Social Media” with New Jersey Supreme Court Justice Anne Patterson, Diana C. Manning, Esq., and Vikram Rajan on Wednesday, December 7, 2016. Sherman Wells proudly congratulates our client and friend Sal Trinchillo of Champion Container Corporation on being named a finalist at the 2016 NJBIZ CFO of the Year Awards! On Thursday, August 20, 2016, partner Anthony J. Sylvester who serves as Trustee to the Gia Maione Prima Foundation announced the Foundation’s sponsorship with the Morris Museum’s Arts Education Program at the Bickford Theatre in Morristown. The announcement was followed by the performance of Louis Prima, Jr. and the Witnesses. The Museum offers education programs that includes workshops and programs to enrich the lives of children in underserved communities as well as those with disabilities. Sherman Wells is pleased to announce that seven of our attorneys have been selected by their peers for inclusion in The Best Lawyers in America© 2017. • Charles S. Detrizio, a Partner in Sherman Wells’ Corporate Law and Banking and Financial Services practice groups, has been listed for 10 consecutive years for Corporate Law. • Sandra Brown Sherman, a Partner in Sherman Wells’ Tax and Trust & Estates practice groups, has been listed for 10 consecutive for Tax Law, Trusts and Estates, Corporate Law, Closely Held Companies and Family Businesses Law and Business Organizations (including LLCs and Partnerships). • Andrew J. Stamelman, a Partner in Sherman Wells’ Tax and Trust & Estates practice groups, has been listed for 10 consecutive years for Corporate Law, Mergers and Acquisitions Law, Tax Law and Trusts and Estates. • Anthony J. Sylvester, a Partner in Sherman Wells’ Litigation, Banking and Financial Services, and Art, Media and Entertainment Law practice groups, has been listed for 10 consecutive years for Banking and Finance Law, Commercial Litigation and Litigation - Banking and Finance. • Julian W. Wells, a Partner in Sherman Wells’ Litigation practice group, has been listed for 10 consecutive years for Commercial Litigation and Litigation - Securities. The Gia Maione Prima Foundation, for which Anthony J. Sylvester serves as Trustee, has entered into a sponsorship with the Morris Museum’s Arts Education Program. The Museum offers education programs that includes hands-on workshops and programs to enrich the lives of children in underserved communities as well as those with disabilities. Sherman Wells is a 2016 Sponsor of the Morristown Jazz and Blues Festival. Festival will take place Saturday, August 20, 2016 on the Green in Morristown, New Jersey. The session, "Ethics Gumbo: First You Make a Roux," included ethics issues within legal malpractice cases such as conflicts of interest and client confidentiality. Sherman Wells Sylvester & Stamelman LLP is honored to be featured by NJBIZ as one of the Best Places to Work in New Jersey for 2016. Of the 100 companies recognized, Sherman Wells was ranked #25 overall and distinguished as the top ranked law firm within the small/medium company category. We are particularly proud to be one of the youngest companies recognized on this year's list. We will strive to continue to make Sherman Wells a forward-thinking company where our dedication to professional growth and quality of life makes a difference. Congratulations to Sandie Sherman on being recognized as one of this year’s SmartCEOs by the New Jersey Brava Awards. The Brava Awards program celebrates high-impact female business leaders who combine an irrepressible entrepreneurial spirit with a passion for giving back to the community, and are exemplary leaders of both their companies and their communities. The Super Lawyers selection process comprises hundreds of thousands of statewide or regional surveys supplemented by a comprehensive examination of each nominee’s background and experience, focusing on such criteria as verdicts and settlements, transactions, representative clients, honors and awards, educational background, and any other outstanding achievements. Only 5 percent of the total lawyers in the state are selected for inclusion in Super Lawyers. Shareholders who claim that they have been unfairly compensated as a result of a merger transaction often have only one available remedy: to dissent from the merger transaction and file a lawsuit seeking a “fair value” determination of their shares. Over the past several years, the number of such dissenting shareholder actions has surged. Julian Wells and Jordan Weinreich of Sherman Wells Sylvester & Stamelman LLP break down the process and provide a primer on what you need to know. The firm was recently featured in an article in NJBiz Magazine. To read the article, please click here. Sherman Wells Sylvester & Stamelman LLP is pleased to celebrate its first anniversary this month. Having opened our doors on July 14, 2014, we are grateful to our friends, clients, families of our attorneys, paraprofessionals and staff for their unwavering support during these past twelve months. As a result of such support, our first year has been successful and rewarding. We look forward to continuing to provide the finest service and representation to our clients and our community. Sherman Wells is pleased to congratulate our colleague, Tracy Child, for being named as one of the 2015 new leaders of the New Jersey Bar. We are pleased that Tracy’s distinguished work in the tax and trusts & estates area has been recognized by the legal community. Counsel Craig Steinfeld was installed as the new Chair of the Banking Law Section of the New Jersey Bar Association at the section’s annual meeting in Atlantic City on May 15, 2015. The Banking Law Section promotes the objectives of the New Jersey Bar Association in the field of banking law, including the dissemination and discussion of specialized information and knowledge and promoting remedial law and procedures for the banking industry. Prior to being installed as Chair, Craig served for two years as Vice-Chair of the section. Sherman Wells congratulates Rachel Moseson on being the recipient of the [3 year] Benjamin Foundation scholarship to attend Rutgers Law School. Sherman Wells congratulates Rachel Moseson on being the recipient of the [3 year] Benjamin Foundation scholarship to attend Rutgers Law School. Trustee and Sherman Wells partner, Andrew Stamelman, noted that “among the exceptional applicants, Rachel stood out as someone who will excel in the classroom, and give back to the Rutgers and local community. She has the qualities of excellence and leadership, and will honor the special qualities of the Foundation’s founder, Elizabeth Benjamin”.